The Celestron AstroMaster Accessory Kit is the perfect addition to any of your telescopes, especially if you own one of the Celestron telescopes which show advanced compatibility with the accessory kit. This kit is best to use for a beginner to intermediate telescope, such as the Celestron AstroMaster 70 AZ, or the Celestron Poweseeker 70 EQ, or the Celestron travel scope for beginners. The right scope accessories can provide a consistent upgrade for your telescope piece, turning it almost into a professional telescope, as you will soon find out in our Celestron AstroMaster Accessory Kit Review. Such an accessory kit, like the the Celestron AstroMaster Accessory Kit, can really turn your cheap telescope into an amazing tool. Similarly, some tools, such as moon filters, for example, are all but indispensable for specific activities, least you would try to look at the moon with the same success you would attempt to look at the sun. Luckily, rather than having you scouring the Internet for the thousands of different, often incompatible telescope accessories, the Celestron AstroMaster Accessory Kit for Telescope is making a great attempt at bundling together the most important eyepiece accessories an amateur astronomer could crave. What is the Celestron AstroMaster Accessory Kit Telescope? additionally, a Micro Fiber Cloth is thrown in as well and, as any telescope owner will tell you, you can never have too many of those. If bought separately, all the components of the kit will reach a cost of well over $100, making the Celestron AstroMaster Accessory Kit a great value pack. 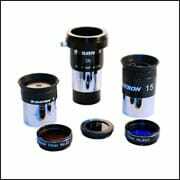 The Celestron 2x barlow lens included in telescope eyepiece kits in particular are great items that you will be hard pressed to find for a lower price, unless you manage to find some used telescope eyepieces for sale. Diverse and useful components. While seasoned veterans who know exactly what sort of tool they require for their specific interest will probably prefer to buy their telescope accessories separately, this Celestron telescope accessory kit is great for both beginners and advanced stargazers who want a good deal for all of them in one place. Amazing value. Clearly one of the best telescope accessory kits you can find for this price, this Celestron telescope accessory kit costs much, much less than the sum of its parts. As far as buying your first accessories for a telescope, the Celestron AstroMaster Accessory Kit is a great starting point. 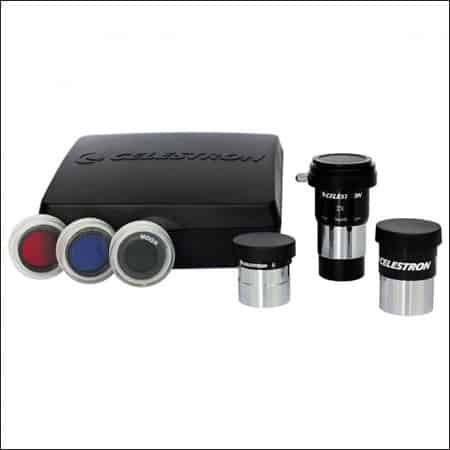 Despite this being a Celestron AstroMaster eyepiece and filter kit, most of its components are not exclusively compatible with the Celestron brand telescopes, but with many other models and brands, making it a good investment, particularly if you own several telescopes. Uneven quality. While the Celestron AstroMaster Accessory Kit as a whole is a great deal, not all of its parts are at the level promised by the rest of the pack. Particularly guilty of this are the 15 mm Kellner Eyepiece and the Moon Filter, neither particularly bad, as much as disappointing. Compatibility gamble. Despite putting the cross-brand compatibility in the ‘pros’ column as well, many Celestron AstroMaster Accessory Kit Telescope reviews note that the compatibility is not universal and, while that might be expected, it is very difficult to figure out, particularly for a beginner, if the kit pieces will be compatible with your telescope before purchasing it. What we do know is that this telescope accessory kit works with most Celestron telescopes, but it is always best to check with telescope accessory reviews on this model to make sure. Where to Find the Celestron AstroMaster Accessory Kit Telescope? You can find the Celestron AstroMaster Accessory Kit Telescope for sale online at Amazon for a regular price of $59.95, on sale for 22% off right now, making it an amazing $46.95. The already great Celestron AstroMaster Accessory Kit Telescope price got even better, making it a no-brainer purchase. 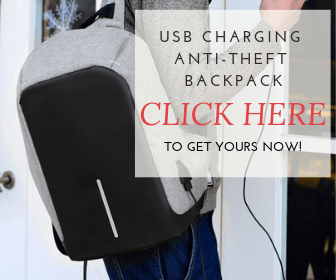 You can also find the Celestron AstroMaster Accessory Kit through other sources, but you should check that they are authorized to sell the product. We encourage our readers to opt for Amazon when buying telescopes, telescope accessories or a set like the Celestron AstroMaster Accessory Kit. 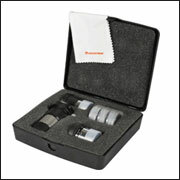 In a great move for its maintenance, the Celestron AstroMaster Accessory Kit for Telescope comes with its own hard-shelled storing case, as well as the Micro Fiber Cloth, making the process of taking care of it a rather self-contained affair. When cleaning the telescope accessories like the eyepieces and filters in the kit, make sure you gently remove dust with the safe cloth. Since the Celestron AstroMaster Accessory Kit pack is made up completely of accessories, this category becomes quite redundant. Stretching the definition somewhat, we can consider the dice-cut foam and the Celestron AstroMaster carry case as being accessories to the accessories, in which case more words of praise are needed for a solid and safe way of storing the product, which more producers should adopt. 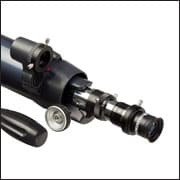 What you can look into is the list of compatible Celestron telescopes and scopes from other manufacturers that will work with these telescope accessories. The Celestron AstroMaster Accessory Kit Telescope comes with a 2 year warranty by Celestron, which includes full repairs or replacement in the case of defective components or damage caused by “normal wear and tear”. 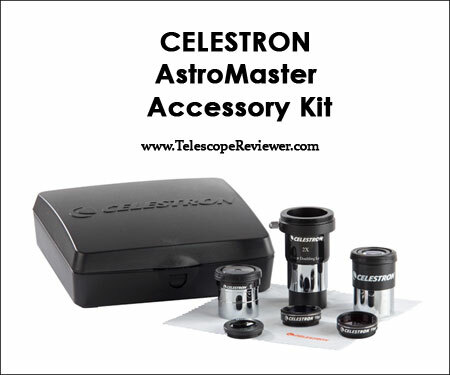 Their customer service can be contacted for more info on the Celestron AstroMaster Accessory Kit warranty. Drawing the line, we conclude this Celestron AstroMaster Accessory Kit review knowing full well that it is not the most sophisticated accessory pack and might not even be among the best Celestron kits, but it covers quite a lot of ground in regards to the offered accessories and functions they can perform. The great magnifying power of the lenses, the DSLR capabilities and the planetary and moon filters will greatly improve your telescope experience for a very small price, in one of the best investments one can make. Instead of trying to hoard all the telescope accessories you can find right after buying your first scope, it would be more fruitful to simply consider a well-conceived telescope accessory kit. The Celestron AstroMaster Accessory Kit may just be the right one, for Celestron telescopes and other brands of telescopes as well.